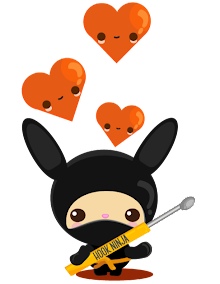 Hi Hook Ninjas! This is a very easy to do crochet pattern, good for beginners. 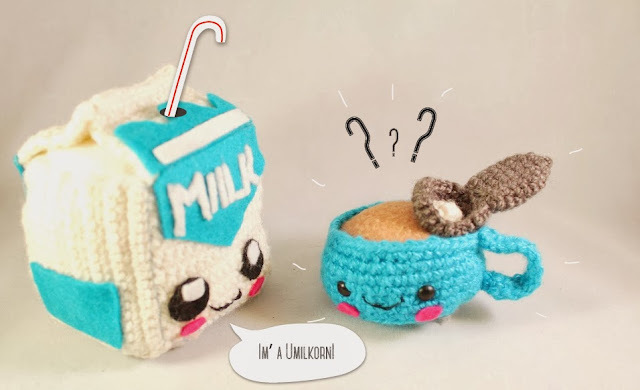 You can use this Amigurumi tea cup with spoon and sugar as a pin cushion or charm for your bag. This project is ideal if you want to learn the different structures of Amigurumis. This one teaches you how to flatten the base of an Amgurumi. Different than the spherical structure of patterns such as this Sun free pattern. Crochet hook of 4mm. Use any hook of your preference but always remember that the size can change depending of your hook size. Round 7--->In the internal loops only<--- Sc around (36 sts) Round 8 to 14 Sc around normally (36 sts) Fasten off. Place safety eyes and fill the cup with your stuffing. Ch 15, turn and sc in each. Flatten your stem and using a tapestry needle sew the stem to the bowl of your spoon. Cut a piece of beige in a circle a little bigger than the diameter of the tea cup. Add the fiberfill stuffing into the cup and place the felt on top of the cup. Sew inside of the cup so the tea level looks like it is inside of the cup. Sew on top of the spoon. Embroider a smile in your Amiguruni. You can also cut two small circles of pink felt to make the cheeks. Do not add any small details if you are making this amigurumi for a baby or a toddler. Let me know how did it go in the comments below! Please contact us if you have any doubts or you find any mistake in the pattern.